Rusty's last name is Riggins and you can't convince me otherwise. And at first--believe it or not--I wasn't sure if that was a good thing. (Sacrilege, I know!) In the beginning Rusty was so close to Tim Riggins of Friday Night Lights fame that I found myself subconsciously gifting Rusty with all of Tim's backstory and hard-earned character development. About a third into the book I realized that Rusty had hardly any of his own. Let's just say I had a crisis of Rusty faith. Was Rusty just a Tim Riggins ripoff? Was FNL doing all the heavy lifting rather than Kirby? Would readers who hadn't seen FNL even think Rusty was special? Luckily that freakout was premature. In the second half, character separation occurred and Rusty, while still being a tribute to the incomparable Riggins, got some much welcomed character growth of his own. Rusty may share the same DNA pool as Tim Riggins (and my mental picture of him definitely proves that haha) but he's a force all his own. Really quickly: I love the maturity of Kirby's writing. 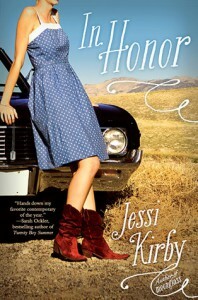 Also I loved the choice she made with where to leave Honor and Rusty. Maybe one day their dreams can merge together? IfyouknowwhatImeanProbably around a 3.75 star book for me.Texas forever.